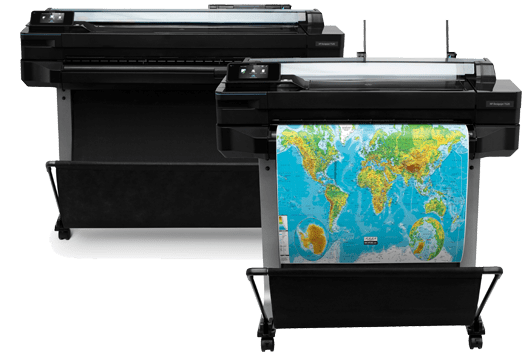 Stargel’s Wide Format Printer gives your business the versatility to print wide format documents. This includes advanced marketing materials, blueprints and much more. A Wide Format Printers gives you the ability to print documents that are 24” or wider. Giving you the capability to print many documents. Documents that you would have previously had to outsource to a print shop. No matter what industry you are, wide format printing benefits your business. Our Wide Format Printer provides you with the capability to print the finest wide format documents possible. Without Wide Format Printing capabilities, wide format documents must be outsourced to a print shop. The current demand for wide format documents is bigger than ever. Especially in the advertising, marketing, and promotions worlds. It is vital that you have the ability to print in wide format quickly and in the highest quality possible. Nothing makes a big statement as a wide format system can. You will be amazed at the quality of the color produced by our vibrant inks. With output sizes of up to 64 inches wide and 150 feet long, you are certain to find a system for your needs. The unique combination of high-resolution engines, specially formulated inks, and media creates amazing image quality. We know those wide format drawings are critical to the AEC, MCAD and GIS industries. Our wide-format systems give you productive output that you can depend on. Our HP and Océ wide format systems integrate seamlessly with most CAD packages. Our multifunctional large format systems allow you to quickly capture and route your documents. Many construction and manufacturing applications require fast access to drawings. These are just a few of the many ways that wide-format printing can enhance a business. Please contact us today to learn more about how you can optimize your business with wide format printing solutions from Stargel!